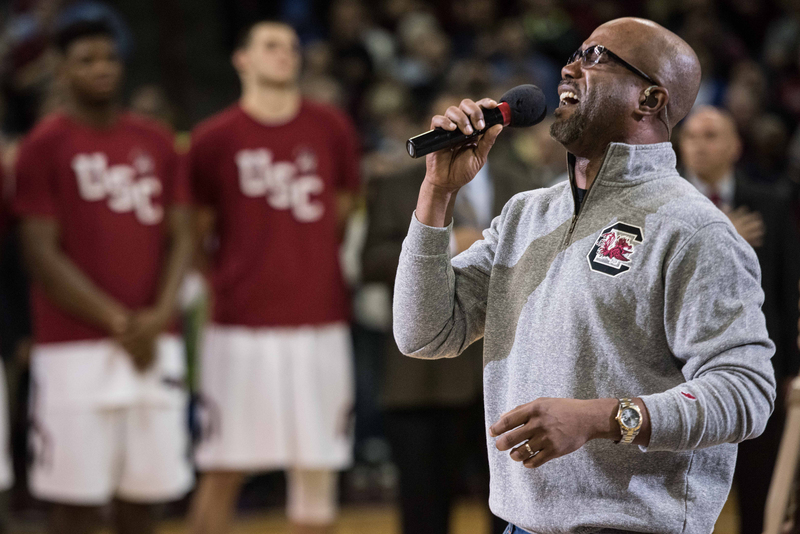 Country music star Darius Rucker loves his South Carolina Gamecocks. He was photographed with tears rolling down his face after South Carolina defeated Florida in the Elite Eight at Madison Square Garden. He played a concert with two TVs below the stage so he could watch the men’s team against Baylor in the Sweet 16. Rucker became a multiplatinum, Grammy-award winning artist as the lead singer and rhythm guitarist of Hootie & the Blowfish, which he formed at the University of South Carolina in 1986 with Mark Bryan, Jim Sonefeld and Dean Felber. In 2008, Rucker’s first single from the Learn to Live album, “Don’t Think I Don’t Think About It,” made him the first African-American with a No. 1 country song since Charley Pride in 1983. A year later, he became the first African-American to win the Country Music Association’s New Artist Award and only the second African-American to win any award from the association. From an impromptu road trip with his son to watch the Gamecocks play against Florida to hoping Dawn Staley can cement her coaching legacy by ending the UConn Huskies’ winning streak if the teams were to advance to the women’s championship game, Rucker went in-depth about his personal relationship with South Carolina. He starts by explaining that picture of him crying with his 12-year-old son by his side. At that moment I was remembering my freshman year of college, when we had the No. 2 football team in the country, and we go to Navy and we’re giving Navy 35 and they beat us by 35. I remember the mid-’90s, having the 2-seed and losing to Coppin State, a 15-seed, and then the next year, having a 3-seed and losing to Richmond. For Gamecocks fans, that was being a Gamecock. To watch that team play the defense they play and make it to the Final Four, I was thinking about [head coach] Frank Martin, who is a great guy, who came here and said he was going to turn it around. There were silly naysayers who said you’re never going to turn South Carolina around, and here we are in the Final Four. Being there with my son, who’s a bigger Gamecocks fan than I am, it all just came to a head. I was just so overwhelmed with emotion and happiness because of the fact that we were going to the Final Four. Darius Rucker sings the national anthem before an NCAA college basketball game between Kentucky and South Carolina Feb. 13, 2016, in Columbia, South Carolina. That’s easy, the other day in the Garden. He and I, we busted our butts to get there. I played a show somewhere in Texas, and he was with me and we drove a little while, we got in a plane, we flew all the way there, just me and him. We get there and we go to the game, and he’s got to go to school the next day, so right after the game we’re getting in the car and getting back in the plane. He and I, we just can’t stop talking about it. We talked about it the whole time. Sindarius Thornwell is his favorite player ever, and he actually wears [jersey No.] 0 in his basketball league. You’re saying the right things, like, ‘I know we’re going to win,’ but deep down inside you’re like, ‘Come on, Gamecocks.’ We lost six of our last nine in the regular season, and we lost in the SEC tournament, so you’re thinking, ‘Are we even going to make the tournament?’ And then they get in, and they start playing tremendous basketball. You can really look at South Carolina and argue they’re playing the best defense in the tournament. It’s not a spoil of riches [having two teams in the Final Four]. Now if people want to talk to me on Tuesday, ’cause we’ve won two national championships, that’s a spoil of riches. Our women’s program, that was one thing I’ve been trying to say to people: We sit here talking about the men, our women’s program is becoming a dynasty. If we can get by Connecticut and win one national championship, then people are going to start using that word for what [head coach] Dawn Staley is doing down there. She’s building this great program that every year is right there, every year at some point in the season is ranked No. 1, and then Connecticut beats them, but every year this is happening for us. Everyone is talking about the men, and it’s great they’re a Cinderella story, but our women are dominating. And right now, I said to somebody yesterday that you can say what you want, but we’re the best basketball school in the country. Both our teams are in the Final Four, both our teams are playing great ball. It’s amazing to be a part of that. I knew Coach Martin was going to turn it around. I didn’t know it was going to turn around this quick. I always felt when he got his players in there that he’ll do something. The sky is the limit now; this is going to definitely help recruiting. When I was a kid, I probably would’ve said I liked Carolina. College sports for me was the NFL and the NBA, that’s what we talked about. The only thing happening back then was Clemson winning the championship in 1981. But when I went to school there in 1984, everything changed. I’d say my blood runs garnet, and even as I got older in high school I really loved the people there. I loved the community there and the alumni. When you see people you say, ‘Hey,’ and acknowledge them. Our sports programs are one of the things that keeps us together and keeps us abreast of news and what’s going in South Carolina. It makes you want to go back there and see all of your old college buddies. I think when I went there that’s when my fandom really took off. I’ve got a bunch of guys I went to college with, and we still see each other all the time, we still hang out. Some of them work with me, and we’re just a close-knit group of people that never let anyone get out of line, never let anyone get a big head, never let anyone think they were too big or too cool to hang out. They kept me in check by just being who they are. They never have to remind me that they were there when it all started, because I know they were all there when it all started. I think I was raised to be the way I am, but I think a lot of it was I went to college and met a lot of down-to-earth, cool dudes who loved their school. We all still go to football games together. We all still hang out together, and I can’t say it was just one person because it was the whole group of guys I hung out with. Loyalty [is the personality of South Carolina]. Our football team lost 21 games in a row, and we sold out every game. We’ve never won a football national championship or a basketball national championship, but our women this year by far led the country in attendance. It wasn’t even close. We’re a loyal fan base who loves our teams, and we give our teams our all. 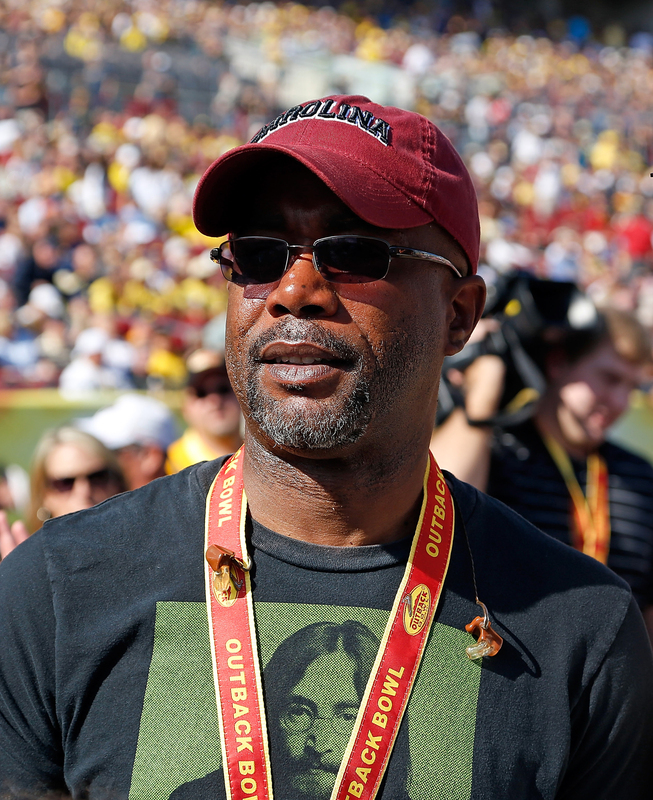 Artist Darius Rucker performs the national anthem just before the start of the Outback Bowl between the South Carolina Gamecocks and the Michigan Wolverines at Raymond James Stadium on Jan. 1, 2013, in Tampa, Florida. My favorite South Carolina player ever is a tie between Sterling Sharpe and Corey Miller. Those guys were great when they played, and Sterling and I went to college together, and it was a great time to be a Gamecock back then. We had some great teams, and it was fun. My favorite players now are P.J. Dozier and Sindarius Thornwell because they’re dominant. They can talk about all those other guys all they want to, but I’ve watched a lot of college basketball and I think [Thornwell] is the most NBA-ready player I’ve seen. He’s ready to play like now. You’ve got to love A’ja Wilson — she’s such a great, amazing player — and Kaela Davis, she’s going to be a superstar. I love watching her play. I love everything about her. I want the [North Carolina Tar] Heels [if the men make the final]. … I want to win it against the best. Roy Williams is a friend, and I love him, and he’s one of the greatest coaches of all time and he’s got an amazing program. But if we win it, I want us to say we beat North Carolina. Don’t get me wrong, if Oregon is there, I want to beat them too, but North Carolina is always there. They have so many national championships. The legend of [former head coach] Dean Smith, Michael Jordan, Sam Perkins and all those great players that went there. I want to beat North Carolina, and it’s the North Carolina-South Carolina rivalry. We’ve got a rivalry for everything, we’ve got a barbecue rivalry, so why not beat North Carolina? If [the women are] going to win it, then yes [I want to see UConn] in the national championship game. I’d love to beat UConn; I’d love to end their streak in the national championship game and see Dawn Staley go down as a legend. People still talk Digger Phelps [ending UCLA’s 88-game streak]. … I want to be the team to end the streak. Rucker will be back in Columbia, South Carolina, to perform a concert at the school after promising to do so if the football team won six games. The show is on Wednesday, and I’m hoping it’s a double national championship celebration. Oh, yeah, absolutely [the teams will be brought on the stage]. Everybody that’s in town will be on that stage. Every team member will be on that stage at some point. I didn’t think we had the [football] players to go win six games. [I thought] there was no chance. They had just gone 3-9. That’s a testament to [head coach Will] Muschamp.